In response to your last question, What right do any of them (the leaders of the program designed to bar evolution) have to discourage their misled followers? I’m not sure I understand what you’re getting at, but I appreciate your comment. When the question is asked “What right does anyone have to discourage them?” I cannot help but answer: every right! I think it is dangerous and irresponsible to have leadership which is dismissive about conducting adolescent experiments on the population and on the state. The most likely scenario of the circus is that some group of people unnecessarily //and without foundation// get their hopes us only to be let down. Not to mention that the likelihood of blood being shed only rises when the mobs are exhorted to “fight to the end” or some such populist nonsense. And this is true regardless of Raffi’s confusing guarantees, including decrees about blood not being shed – as if he could guarantee that. I’ve interpreted this now familiar message before in other comments on other forums. So what do you propose exactly as an alternative to Raffi and this movement? Constructive criticism is one thing, but criticism for the sake of it, without any purpose or intention other than to discredit and discourage, is disconcerting. 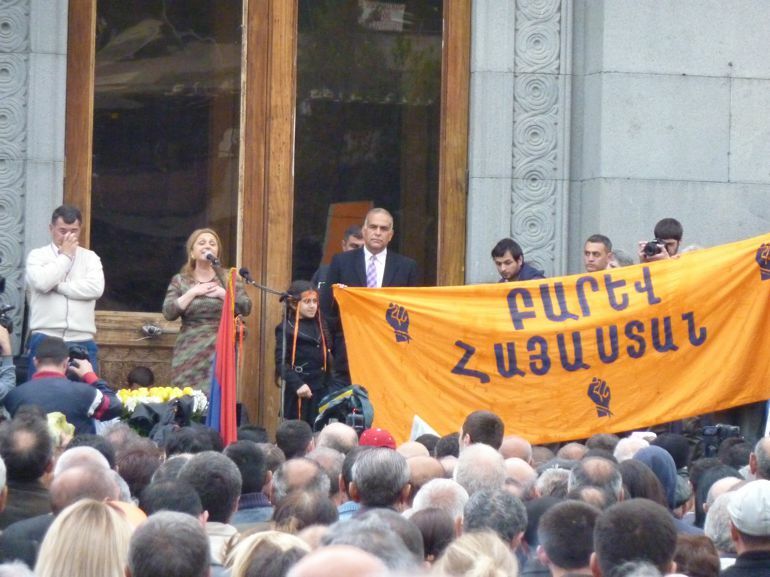 I still have yet to read one convincing argument from any critic not based in Armenia that there is a viable, worthy alternative to this oppositional movement or the political status quo with the authorities in charge. In other words, I understand that you and several others in cyberspace hate everything about Raffi and what this movement stands for (likely from thousands of miles away) but the reason for that disdain is quite unclear. Unless, of course, it’s a personal matter. 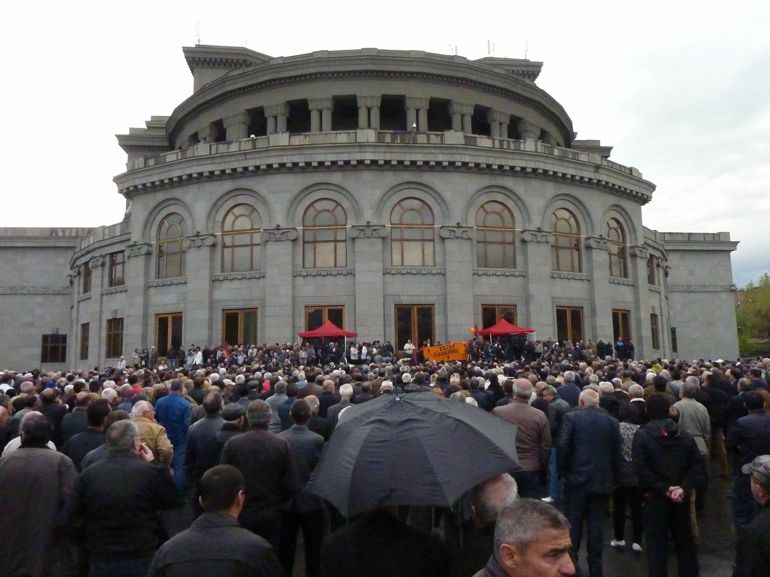 First of all, carting out politically bankrupt retreads (Ter-Petrosyan, Pashinyan, and the rest) and expecting everyone to buy in to some show in the square simply because the government needs changing is not equal to legitimacy of the opposition. Raffi started out differently this time around, but quickly demonstrated for all to see he has no plan. 1) When there is an election around the corner, the electorate deserve to hear the action plan. So far, daily speeches, but no agendas. 2) Raffi claims to be for constitutional democracy, yet fails to follow the norms when convenient. You have a problem with the elections, fight in court, and go in prepared. Not presenting anonymous claims that you cannot substantiate, and then when exposed for unpreparedness, just blame the system. Heritage had members (even chairmen) in the precincts where he later claimed violations. Precincts where his own trusted team signed off on the legitimacy of the elections he later contested in those very precincts. His mantra of democratic state-building is disingenuous. 3) When offered a chance by the government to get engaged and improve things, he avoids building upon his now squandered political capital. A sign of laziness and lack of long-term strategic thinking. Add up these and many other issues, and this is why he is unfit to lead. It is not about us vs them, personal agendas, hatred, or anything else you misinterpret in your question above. It is simply about him — or anyone else for that matter — presenting a viable alternative to the people, most of whom are thankfully not naive enough to participate in the opera circus.